It’s so easy to get stuck in the ‘doing’ of life. Pushing yourself mentally and physically each day to try and complete a never-ending list of to-do items often leaves you feeling frustrated and exhausted. Then you get to wake up the next day and do it all over again without any relief in sight. Without taking time-out for yourself to stop and smell the roses each day you are really pushing yourself into an early grave. The extra stress and tension that accumulates in your body as a result of constantly being on-the-go, not taking proper care of your body and living an adrenaline fueled life can be devastating. That’s why it’s so important to give yourself at least 5 to 15 minutes of self-care time a day… and there’s no simpler and accessible form of self-care than meditation. You can meditate anytime and anywhere you like, it’s free to d, and the benefits of meditation are very well documented. So, how do you know if meditation is something that you might need to focus on right now? Here’s my top 5 reasons why meditation may be a must for you. Sure, there are going to be things that agitate you from time-to-time but what I’m talking about here is when you start to notice that even the smallest of things are starting to piss you off for no reason at all. This is usually a symptom that there is a bigger issue that needs to be resolved but it can also mean that your body is overworked and needs to recharge. 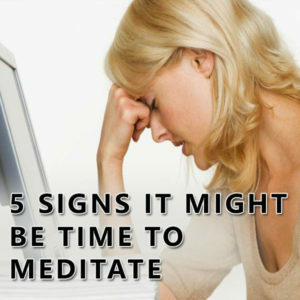 This constant feeling of annoyance or frustration is a major sign that it’s time to meditate. Simply find somewhere comfortable to sit, close your eyes and focus on your breathing for a few minutes. This will help to clear your mind and rejuvenate your energy levels. We all know what that looks and feels like. It’s so easy to let yourself get distracted by anything and everything when there is a task at hand you don’t really want to do – lord knows I’m an expert at it. Yet, all this does is waste time and energy and still leaves you with a backlog of stuff to do that is incomplete. You can then start to feel bogged down and end-up spirally into anxiety or depression. You could of course always see if you can delegate certain things you don’t want to do but for those things you can’t then meditation will help. By getting out of your head and centering yourself again it gives you a fresh perspective so that you can re-focus and finish what you need to do. Lethargy is that feeling of sluggishness or lack of enthusiasm that can arise from all sorts of physical and mental conditions like tiredness, boredom, overexertion, or even poor diet. It makes everything feel ten times harder than normal and cause you to try and avoid doing anything that will take too much effort. This is a great time to meditate because it will give you an opportunity to free up your energy so that you can feel lighter and more inspired. The best type of meditation to do when you are feeling lethargic is a moving meditation like running, shaking, or dancing like nobody’s watching. If you find yourself bogged down by negative thinking to the point where it is impeding the way you work or relate to people, or even how you relate to yourself, then it’s time to meditate. Negative thinking can send you into a downward spiral of negative thoughts and emotions that can lead to things like headaches, mood swings, or ruining your day. Meditation is a simple ways to bring your focus back to something like your breath so that you can take a break from your thoughts and find your center again. Once you have centered yourself then you can start again with a sense of calm and clarity. Making decisions is relatively easy. It literally only takes a heartbeat to make a decision about anything as that’s how fast the mind works. yet, all too often you can procrastinate on making a decision even if you know what decision you need to make. When this happens, is usually because of uncertainty which comes from fear of the unknown. Sometimes, you may just need to gather more information but really your intuition always knows the answer – it’s just that you don’t trust them as much as the mind. When you’re feeling indecisive take a few minutes to sit down, close your eyes and connect with wither your heart or your gut feeling. As soon as you do, you’ll have your answer.